Looking for a durable soft dog toy for your canine friend that lasts? Then you need a Tuffy® toy sold by Salubrious Day! TuffieToys.com is a division of Salubrious Day located in San Diego, California. We are independent online resellers of Tuffy® brand pet toys. Like you, we are dog lovers who only want the best for our four-legged friends. We at TuffieToys.com believe strongly in the quality of the products we sell. We make every effort to ensure you, our customers, get the best toys for your pets. We do this by selling only the highest quality products, and by providing exceptional customer service at every step of the process. If you need help deciding which is the best toy for your dog, contact us and we'll work with you. In the unlikely event the product manufacturing is defective, we'll replace it, or refund your money, no questions asked. Anything you need, just ask and we'll do our best to answer your questions to your satisfaction. Our dogs, Dolly and Shadow, take their jobs very seriously too. They're our best "Product Testers" and love playing fetch with their Tuffy Toys and will play for as long as our arms can take it. Tug-o-war is another of their favorite games and they will try to out tug each other until they're exhausted. We hope your pets enjoy their Tuffy toys as much as ours do. The Mega Series Toys are by far our toughest and most durable dog toys. These interactive dog toys are tough high quality pet toys that are lots of fun and will provide hours of play for you & your pet. All Mega toys have a Tuff Scale rating of 10. (Note: Tuffy toys are not chew toys.) Each Mega toy has seven layers of material sewn together with two rows of linear stitching and two rows of cross stitching. The four rows of stitching are protected with an industrial grade luggage material that is sewn three more times. Seven Layers of Material: Three layers of 600 Denier industrial grade material, three layers of plastic coating and finally one layer of soft fleece. All seven layers are rolled together and then sewn with a one inch cross pattern to prevent layer separation. Protective Webbing: Additional industrial grade luggage material is sewn around the outside edge with three rows of stitching to cover and protect the first four rows of stitching. Squeaker Safety Pockets: Each Squeaker is safe and quiet because they are sewn into a nylon safety pocket beneath seven layers of material. Some dogs require toys with a little extra durability. The Ultimate Series Durable Dog Toys have Tuff Scale ratings of 8 and 9 to last longer. We have a wide selection of styles and colors just the right size and tuffness for your dog. As an added bonus, the soft edges won't hurt your dog's tender mouth. So they can play catch or tug-o-war with their heavy duty dog toys for hours on end. Each Ultimate toy is made with four layers. Two layers are made of industrial grade luggage material, one layer of plastic coating, and one outer layer made of soft fleece. All four of these layers are sewn together to make one super strong layer of material. Each toy is sewn together with two layers of cross stitching and then two layers of linear stitching. After the toy is sewn together an additional piece of black trim is added to cover the four rows of stitching. This extra piece of black trim is sewn with three linear stitches to give the product a total of seven seams! Your pooch will absolutely Love his or her own set of furry iBalls! Silly Squeakers are a line of fun, creative and hilarious rubber squeaky toys that are sure to have everyone talking. We pushed the limits of our imagination to bring you this series of one-of-a-kind toys. They are sure to bring you and your dog tons of fun and laughter! The core of this toy is a tough, durable ball, so if your dog does get to the core, it's just like having a whole new toy to play with! No white poly stuffing. Don't let their size fool you. Small dogs need Tuffy Toys just as much as big dogs. We have a wide selection of Jr Series Durable Dog Toys, styles and colors just the right size and Tuff Scale for your "Little Angel." As an added bonus, the soft edges won't hurt their tender mouth. So they can play catch or tug-o-war with their small dog toys for hours on end with no problems. Just like the larger Tuffy toys, Jr toys are also made with four layers of material and seven rows of stitching. How Are Tuffy Toys Made? Tuffy toys are the most durable soft toys available. They are made with four layers of bonded material (fleece, luggage material, plastic), stuffed with non-toxic fiber, and assembled with seven layers of stitching for added durability. Note: Mega toys are made with seven layers of material for maximum durability. What Toy Is Best For My Sized Dog? How Loud Is The Squeaker? The squeakers in Tuffy Toys are loud enough to excite a dog but quiet enough to not be annoying to their owners. Dogs enjoy hearing the little squeaks -- you'll enjoy seeing their fun -- and will appreciate that the sounds are softer than many irritating squeak toys on the market today. My Dog Chews Up Every Toy He Gets Within Minutes. How Are Tuffy Toys Any Different? Tuffy Toys are made with multiple layers of durable material and seven layers of stitching making them one of the "Tuffest" soft toys available. However, keep in mind that Tuffy Toys are NOT chew toys and will not stand up to a dog's constant chewing. Tuffys are intended for interactive play & training between you and your dog. So if you play with your dog then put the Tuffy Toy away when you're done, Tuffys will last quite a long time even with rough play. What Do Customers Say About TuffyToys? I am HUGE fan of the Tuffy Toys. They are the only brand that I have found to last a long time, even after being washed. Both Hera and Venus love that they are soft, and I love that they last. Maribel, a long time loyal customer. I thought you might enjoy this picture of my handsome boy, Titus, and his favorite Tuffy Boomerang Toy :) I absolutely love your line of products, we've tried pretty much every brand of dog toys out there and Tuffys are the only ones that are built for chewers like Titus :) I won't buy any other brand cause I might as well throw my money away. Keep up the great work. I am a mom to Tilly, a 2 year old Great Dane. I would like to say thank you, thank you, and THANK YOU for a wonderful product. My "little" girl loves your mega toys. She is so rough on toys and they are the only thing that lasts. When she sees me pull one of your mega rings out of the bag, she is so excited! And the fact that you have come out with more options in the mega series is a plus as well. Thanks again! Order Your Tuffy Toys For Your Dog Today! Perfect for training and interactive play with owners. 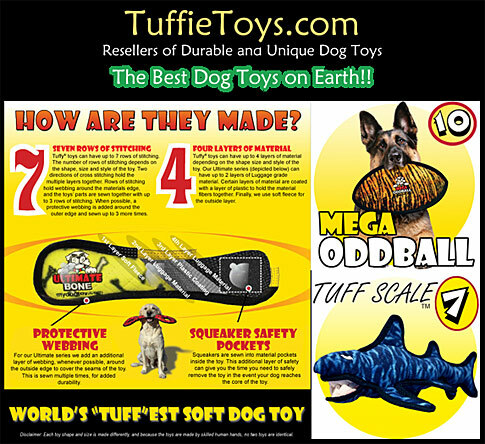 Tuffy Toys will make time with your dog fun and enjoyable for you both. We are excited to hear from you and to learn more about your dogs and the kinds of toys that might suit them best for the games and training they are participating in. For more information about Tuffy Toys and to see our entire collection of products please visit us online today!